I’m a big fan of Amazon Web Services. So scalable. So intuitive. So click-able. Maybe I just feel like a kid again, playing with my digital LEGOs. Naturally, I had to try out Amazon’s latest toy–Machine Learning. Admittedly, Amazon’s embracing of cloud-based ML is perhaps a bit tardy (announced in April 2015). After all, Google appears to have launched their Prediction API in 2010 and Microsoft Azure ML pre-dates Amazon’s offering by about a year. Furthermore, at the time of writing, Prediction API and Azure ML are arguably more complete offerings. For example, Azure ML features modules for neural nets, tree-based methods, SVMs, etc. Here’s the most complete list I could find. But I digress. The data needs a little loving. First of all, date and time are smooshed together in a single timestamp. Is the specific time or date even relevant? Let’s turn those into coarser and hopefully more significant units of time: month, year, and hour. After implementing this minimal pre-processing in Python, I was ready to upload. As an aside, I’d recommend following Guy Ernest’s advice to shuffle the data and upload to S3 with the AWS CLI. When you point to a new data source in Amazon ML, you’re required to specify a schema and select a target variable (which later determines the machine learning algorithm). They’ve clearly thought this process through–evidenced by helpful graphs, such as the target variable distribution in the training set. With the data source defined, we create a new ML model. The algorithm is automatically determined by the target variable (multi-class classification). We can customize a few options–the test-training split, regularization type, and do some advanced feature-engineering using a “recipe”. I wanted to see how well this performed out-of-the-box, so I chose default settings. Amazon ML takes a few minutes to run on the 90 MB, 878,000-row training data; insofar as I’m able to divine from the log files, it’s running atop Amazon EMR (i.e. Hadoop). Still waiting. Wonder if I still have one of those Lagunitas Little Sumpin’ Extras in my fridge? OK, it’s done. And it really didn’t take that long. For multi-class classification problems, F1 is the metric reported. And our report card doesn’t look very good. The problem is apparent; we’re predicting too many larceny/theft crimes. Far more (51%) than were present in the training data (20%). 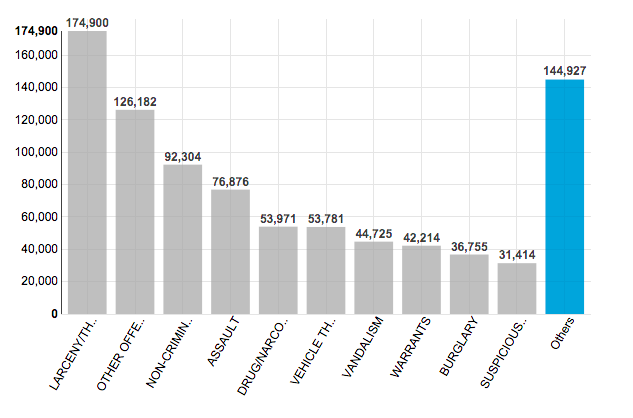 But there’s a glimmer of hope: this Kaggle competition doesn’t use F1 as the evaluation metric. It uses a log-loss function. However, the two are likely to be strongly correlated. The output is more informative than a simple one-prediction-per row. 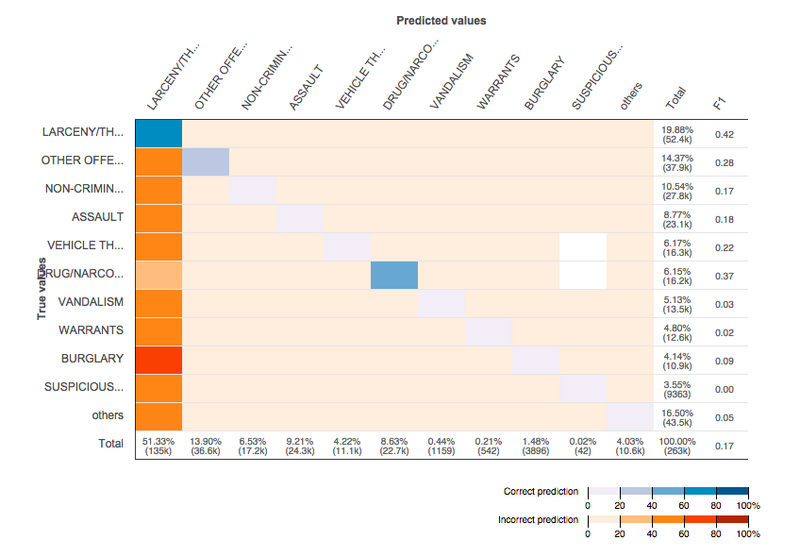 The entries are one-against-all probabilities (see Amazon ML documentation), so to arrive at a single category prediction, we simply select the column with the maximum value (cue more Python finessing). Finally, the predictions are in the format Kaggle requires. Upload. Wait. 262nd place out of 330 with a log-loss metric of 24.9 (lower is better). Amazon ML may not be the right tool for this job; or perhaps it just requires more clever feature-engineering than I had devised. Perhaps some precision in the latitude and longitude is being lost due to rounding. Would I go to a client with this sort of accuracy? Absolutely not. But Amazon ML is about speed, convenience, and scalability. For the SF crime problem, it’s a way to “fail quickly” and move on to approach #2. You, the team manager, must select a team from a pool of players; your choices are constrained principally by a salary cap and the positional requirements of the roster. The pool of available players might consist, for example, of all NFL players who have a game on Sunday, November 30. Each player has an associated cost–a healthy Peyton Manning might cost $9,000 in a league with a $50,000 salary cap. If we can obtain player point projections from a third-party site, an interesting albeit recreational optimization problem emerges. Pyomo is a flexible modeling framework for Python which is written and maintained by Sandia National Labs. Furthermore, it’s supported by the COIN-OR Foundation (under the now-deprecated name Coopr). For an open-source project, it possesses an unusually good level of support and documentation. I’ve worked with a few specialized algebraic modeling languages (MathProg in conjunction with GLPK and Xpress-Mosel) and I came to realize some inherent limitations in their static treatment of data. Sure, there are control structures in Mosel and difficult-to-learn APIs for GLPK, but nothing I’ve encountered offers the fluid model-building paradigm of Pyomo. Do you want to read a static data set, pull in real-time S&P 500 data, build dynamic constraints, pause to cook an omelet, then throw out all data lines that contains the word “aardvark”? Pyomo has you covered. Model building can be stopped and started at will because it’s all performed in-line with your other Python code. For more information about supported solvers and additional components, such as the stochastic programming extension, see http://www.pyomo.org/about/. Let’s conjure up a fantasy league in which we’d like to choose 1 quarterback, 2 wide receivers, 2 running backs, 2 tight ends, 1 defense, and 1 kicker. The salary cap is $50,000 and we’re keen on maximizing the sum of projected points. The SolverFactory sub-module interacts directly with the solver (GLPK in this case) and returns the results directly to create a self-contained Python script. Next, the program imports the player data using pandas in lines 6-8. By convention, index sets are capitalized while data vectors are presented in lower-case. The dictionary psn_limits prescribes roster limits for each position. Next, the player names (index set), projected points (data), cost (data), and position (data) are extracted from the pandas data frame. When I first wrote this script, Pyomo preferred Python dictionaries and lists as model inputs; this may no longer be the case, but I encourage the reader to consult the extensive documentation for him or herself. The intermediate set() function in line 16 removes potential duplicate player names. Pyomo users may formulate concrete or abstract models. Abstract models are purely algebraic constructs which are later populated wholesale by static datasets in much same way as MathProg in GLPK or Xpress-Mosel. Concrete models, to me, better illustrate the power of Pyomo–namely, the ability to dynamically load data from native Python structures. Pyomo constraints can be defined by rules which are merely a function returning the desired constraint expression. The second constraint is really a set of constraints, one for each element in POSITIONS. Note the extra argument in the rule-function definition and the index set passed to the Constraint object. Approaching the end, we define the objective function with syntax similar to constraint definition. The summation() function provides a useful shorthand for element-wise multiplication followed by summing (i.e. a dot product). The remainder of the code runs the optimization model and prints the results. Line 53 offers a helpful trick: the optimization results are returned in a raw form from the solver; instance.load() pulls the raw data back into the model framework where we can more easily query the results by player name. Disclaimer: it is the author’s wish not to encourage gambling, but rather the pursuit of statistical education. Over lunch yesterday, a coworker remarked, “I wonder if the digits are uniformly distributed?” We had no reason to believe they wouldn’t be, but I decided to investigate. First, I downloaded and cleaned the data from here. The 17,425,170 digits of the 48th Mersenne prime take up about 35MB on my hard drive in comma-separated form. Next, I imported the data in R and used a humble hist() command to generate a histogram. The graph itself isn’t terribly informative, but below are the frequencies which resulted. The whole process consumed about 6 real-time seconds on an AMD Phenom II 3 GHz quad-core. At a glance, the digits do appear to be uniformly distributed. After all, we’d expect to see 1,742,517 of each digit. Satisfied? Hardly. There are all sorts of statistical tests available for assessing a frequency distribution’s similarity to a known distribution. For this task, I chose the χ² goodness-of-fit test. The null hypothesis supposes that observed distribution of digits is consistent with a uniform distribution. 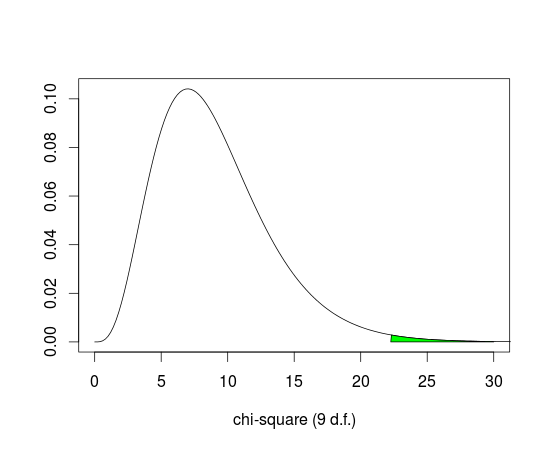 Where O_i = observed number of digit i. E_i = expected number of digit i. The result is χ² = 22.2603 and a p-value = 0.008, illustrated below. In conclusion, the goodness-of-fit test causes us to reject the null hypothesis for “typical” values of α (0.01, 0.05). Against intuition, the test rejects the notion that the digits are uniformly distributed. Here’s the R code. Feel free to modify and explore! ## Description: a new Mersenne prime was discovered in Feb. 2013.